CHICAGO (WLS) -- Three people were hospitalized after a crash involving a CTA bus in the Calumet Heights neighborhood on the South Side Sunday morning, police said. 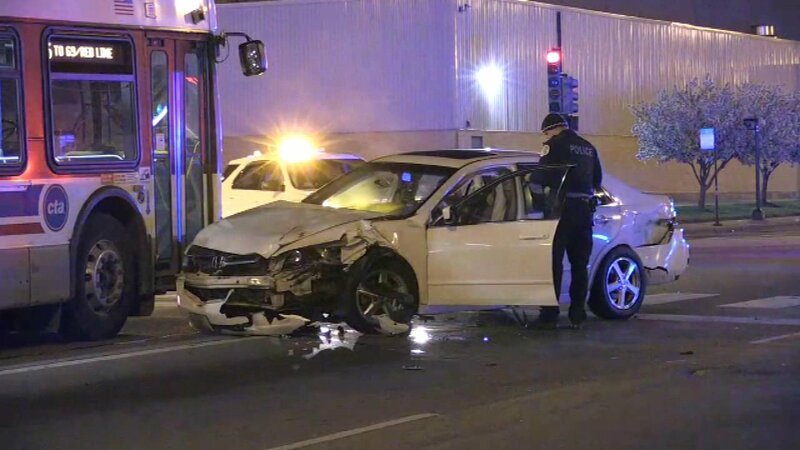 A white Honda Accord was traveling south in the 9500-block of South Stony Island Avenue at about 3:44 a.m. when it collided with a Toyota Camry traveling east on 95th Street, police said. The Toyota then stuck a CTA bus. Police said three people were hospitalized with non-life threatening injuries. The driver of the Camry was issued citations for failure to yield right of way on a left-hand turn, and failure to reduce speed to avoid an accident, police said.